Longboard has been a popular action riding sport ever since it was introduced as a fun form of transportation in the 1950’s by a group of surfers, initially as surfing boards, and later this idea was innovated into a piece of a long wood plank with wheels attached to it. Longboards are mostly used as a sports tool. Other uses may include simply riding it around town with pals or alone. Usually a little bigger in size than its counterpart skateboard, it too, just like skateboards, comes in variable sizes and shapes. Longboards are mostly known for its greater stability, durability, and traction. These variations in physical appearances serve different purposes to the rider, which means the rider will need to buy different longboards to enjoy different riding styles. As the name probably gives it away, Downhill Longboards are perfect for riding downhill slopes and the curviest terrains. These Longboards are accessorized with a defined rear end to assure smooth changes in direction while turning. One of the colossal issues faced by a Downhill rider is speed wobbling. This can be solved by purchasing a quality Longboard. If you are looking to ride in relax mode, Drop Through is the appropriate Longboard for you. Drop through mounting lowers the rider’s central gravity providing a greater stability, making it perfect for merely cruising around, entailing considerable safety for the rider. When it is considered to be one of the most important skills to learn, appropriate Longboards holds the status. Carving Longboards are made to ensure that the rider is able to make sharp, angular turns. CruisingLongboards have wider deck and truck. This allows smooth non-exceptional rides. This type of board is ideal for riding to the mall or crowded places. 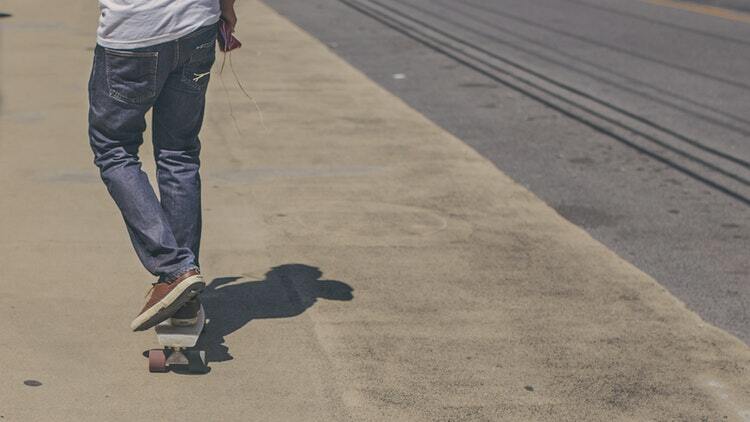 Due to having wider truck and deck, cruising longboards provide exceptional stability to the rider. This type of longboard is perfect for beginners at longboarding. If you are looking to Go Green and light, bamboo longboards provide the perfect accommodation. Apart from being lightweight, bamboo longboards are completely organic, also allowing easy riding. Good quality bamboo longboards can last a long time. The only drawback is it can be difficult to replace the wheels if they wear out. If you have got skills to show off, this particular longboard is just for you. Having a pointed nose and tail, this brand of the longboard is ideal for taking sharp turns and directional riding. It is the best longboard for mastering balancing and tricks. These longboards have a shorter nose and tail which makes it inconvenient for a skillful rider, but convenient for a beginner as it is easy to learn tricks with. The rounder, wider nose and tail ensure better safety, especially to a beginner who has yet to find his balance. This type of longboard is a hefty one as it provides the least stability to the rider. This makes it unsuitable for a beginner in longboarding. Otherwise, its shorter sized deck is ideal for making quick sharp turns. It is not recommended for a rider if he is not skilled at longboarding. Due to having wider sides twin longboards are typically ideal for learning new tricks and improving your overall riding skills. These boards were introduced in the 90’s for freestyle riding. It is said that when buying twin longboards, it is recommended that you install soft wheels instead of the regular ones, this will allow you to learn amazing skills. This type of longboard comes with drop through trucks, which will allow it to lower the longboard giving proper stability. It is ideal for free styling, downhill riding and free riding as it has the ability to use large wheels and take deep turns. Its overall built allows it to resist skidding while riding. These longboards are bi-directional which allows easy switching and turns to take place. These longboards allow the rider to push easily due to having a lower deck and a nose. This feature is known to provide great comfort to the rider. Speed longboards provide better stability and as the name speaks for itself these longboards are perfect for speed riding and also better stability at high speed. Different longboards are available for riders at different stages. It is important to know your riding abilities before deciding on a longboard. Sometimes due to being at different levels and having mixed skill sets, it can be a challenge for riders to decide on a specific longboard. It is important to know your progression throughout your longboarding journey. It is better to take the time to research your longboards before deciding on a longboard, for example a downhill longboard will look and serve a somewhat different purpose from a longboard which was designed for freestyling, Different decks shapes, sizes, nose length, etc. give these longboards their unique appearance to serve a different purpose from each other. Each Longboard is for a particular riding style. Even though it may seem like an overrated sport from the 20th century, it is still a fascinating action riding to many who have explored a longboard. School children in some countries take this as a sport too. These kids can be found riding around town with friends or at skate rinks performing neat tricks. A longboard is fairly different from a skateboard, appearance, and performance wise, but that is a long lost fact given the drastic similarities between them. A traditional longboard is typically larger and longer than a traditional skateboard. Longboards were unintentionally invented when a group of surfers came up with a tool to surf on. Longboarding is done out of the sole purpose of having fun or an actual sport. It can be a great exercise as you are expending energy from trying to keep your longboard in control and balanced with you balanced on top of it, with one foot pushing off the ground to maintain a constant speed. It is more convenient to use than other larger transportation’s; Longboarding saves physical space, fuel money, environment and keeps you fit. Many have been seen to longboard to and within university, office, etc. This indicates that its usefulness is becoming more notorious each day. Youths of the last two decades have left their marks in the longboarding world. They had access to rinks and stadiums which were made purely for the purpose of longboarding. Children in the past used longboarding as a mean of reliable yet fun sort of transportation. Groups of adolescents could be seen rolling around on four wheels, performing occasional tricks and stunts to gain a few “ooh”s and “ahhh”s from passersby. Unsurprisingly children in those times were also much fit in comparison to today’s children. Longboarding is one of many sports which keeps you fit. Prolonged longboarding builds stamina, agility, and balance. Longboarding regularly serves you your daily shot of cardio, keeping the weight at bay. If combined with other core strengthening exercises your body will be feeling stronger and lighter than ever. Performing tricks requires a lot of quick movements. This helps burn fat and build lean muscles. In summer, this could be considered as one of many fun ways to lose weight with friends or family, after a long fun session of longboard purchasing. While concentrating on the role of legs so much, we forget about the abs workout being carried out. Along with your legs, your torso stays under pressure of making quick movements in order to control the board and the direction it will go in. If mixed with a strict diet, you are bound to have a skater body abs in no time. The word agility speaks to power, flexibility, and greatness. You are able to make quick frank moves without having to feel tired and loathsome. Your body will not feel heavy and sweaty anymore. Flexibility means volumes for a great health. You lessen the risk of experiencing joint pain or muscle tear. An average working person spends approximately $1000+ on a car per month. With the purchase of a suitable longboard, you will be saving that $1000 for sure. Now that is drastic save of money! A good quality longboard will last 10 entire years if not faced with a physically damaging accident. Longboards are extremely durable. Even if used every day they will last you a very long time. You can upgrade your longboards after two years as well to a newer design. A longboard is approximately inches long and a few inches wide whereas the same cannot be said about a car. Longboarding to work could be a smart alternative to driving a car to work every day; saving your car mileage from shooting up, sparing a parking space, saving you the constant gas trips to the pump station and you can dodge traffic on your way to work/school daily. A longboard can easily be tucked away under your work desk so you will not need to occupy a parking after all. Global warming is enough concerning as it is, resulting in drastic climate change. Now there is also the scarcity of fuel on earth. Reducing carbon footprints can do wonders for the environment. Longboarding is in no need of fuel use. They operate by feet; one foot is to always remain on the deck and one foot is used to push off the ground every now and then. If your home is not too far from your destination, longboarding is a healthy, green alternative to a car that runs on gasoline. Longboards have been around since the mid-1900’s. Although it had its ups and downs on the stage of fame, it has always made a comeback. It seems that people cannot seem to forget or avoid the advantages that come with the ownership of a longboard. From primary school children to university students to working adults, male or female, longboarding knows no segregation. Anyone of any walking age is welcome to purchase one. It is after the first longboard purchase that most riders choose to grow up with it. It is after learning to balance themselves that riders find their freedom are on a longboard. The first trick performed independently is always cherished in a rider’s memory. This goes to show that the choice of longboarding may be more personal and close to home than it appears. Skateboard parks are still as popular to this day as they were in the 80’s and 90’s among best skateboard riders and longboard riders. Most rinks are teeming with creative performers and riders who just generally ride to have fun. Longboarding is the lifestyle of the free and fun ones. There is a great amount of tranquility in being physically able to move quickly and away from any situation on a piece of wooden plank on wheels. A Longboard is not just a longboard, they become a part of your identity through the years of bonding. So why not feel the thrill today?